Have you ever heard about mindfulness and being mindful, but thought it was something out of reach? Well, we have brought a short exercise for you to try. It is led by our very own Dr. Jo Ann Unger from the Clinic Psychology team! 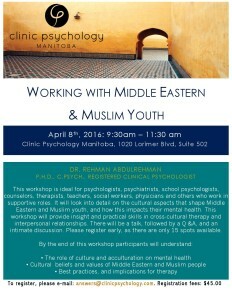 Clinic Psychology is happy to announce a workshop on ‘Working with Middle Eastern and Muslim Youth‘. Our aim is to build cross-cultural understanding and competency, to improve relations and create effective change in society. This is the first of our series of workshops, and we are hoping to bring many more to the public. This workshop is ideal for psychologists, psychiatrists, school psychologists, counselors, therapists, teachers, social workers, physicians and others who work in supportive roles. It will look into detail on the cultural aspects that shape Middle Eastern and Muslim youth, and how this impacts their mental health. This workshop will provide insight and practical skills in cross-cultural therapy and interpersonal relationships. There will be a talk, followed by a Q &A, and an intimate discussion. Please register early, as there are only 15 spots available. There are only 15 spots available – we have limited this workshop to a small group to maximize interaction and have meaningful and enriched discussions. 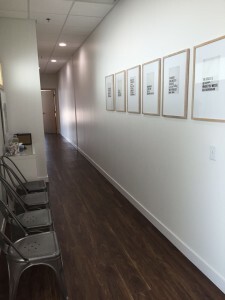 Finally added some final touches to our office space! Some inspirational quotes are always good for the soul!